Knit By God's Hand: Seriously? I'll say something (I AM my mother's daughter you know). 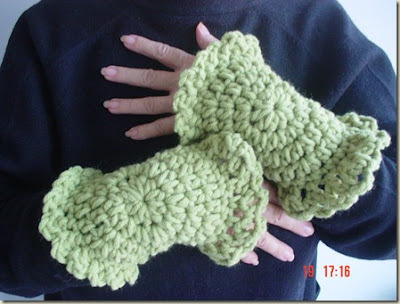 They look like pot holders wrapped around your hand!!! The 1st wrist warmers are so pretty! The 2nd ones look like fuzzy cabbage leaves! Oh my, I hope the green cabbage leaf looking ones were very inexpensive. I'm not sure I would have taken them even if they were free. Okay... I'm thinking something off the back of my great-grandma's toilet tank... you know... where a candle or maybe a doll would be sitting!!!! Aren't you glad I didn't make those for you? Would you have felt compelled to wear them because you love me???? The first are cute. The second...not so much. And right before I posted this I saw Rachel thought the same thing! Definitely like the first ones better! Ummm...okay. It does resemble pot holders. I agree with Rachel on the second set. Why do we need wrist warmers? I need an elbow warmer. My right elbow to my finger tips always feels cold when I'm typing. CRAZY! I probably have carpal tunnel. those second ones are quite large, are they not? but a pretty color. My youngest daughter walked in when I was looking at the 2nd picture. Her comment was "What happened to them hands?" Oh the ones your friend made are gorgeous! The other ones are...interesting! I agree with Rach they look like pot holders!! And not even pretty pot holders.. I like the green ones! It's like the Grinch!